Sports festival: over 4 years of postponement worries silver medalist – Royal Times of Nigeria. Adamu Yahaya, a karate silver medalist in the 2012 National Sports Festival, NSF, has called on relevant authorities to come up with a definite schedule for the NSF. Yahaya was reacting to continued postponement of the biennial festival which was held last in 2012 in Lagos. Yahaya, while speaking with newsmen today in Lagos, said that the postponement is at the detriment of young sports talents, adding that it has affected Nigeria’s sports generally. While saying that that the NSF has meaningfully engaged youths in sports and helped many to be independent, Yahaya calls on the Federal Ministry of Youths and Sports to address participants about their plans for the festival. 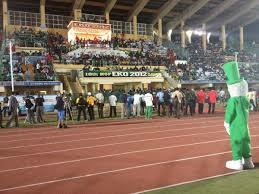 NSF is a biennial multi-sports event initiated in 1973 and organised by the Federal Government for Nigerians athletes. It is a major avenue to hunt for talents to represent Nigeria in sports events.